Relational Technical Analysis™ course review - by Ed B. - "I have to say that it is by far the best course and educational stream that I have ever come across in the investment industry." Student writes "I like to swing and position trade my own accounts and the results have been truly amazing which I attribute to your educational material." I purchased and absorbed the Relational Technical Analysis™Course and I have to say that it is by far the best course and educational stream that I have ever come across in the investment industry. As a discretionary Portfolio Manager, I have been making far better trades and decisions on behalf of my clients for position and longer term trades. The returns this year to date have been amazingly high. As well, I like to swing and position trade my own accounts and the results have been truly amazing which I attribute to your educational material. When I combine the TC2000 scans, my development of spatial pattern recognition and the understanding of who is in control of the price, it makes for really enjoyable and very profitable trading. I’m getting to a point where I see the proper conditions and just place the BSLO and SSLO orders on the best looking trades without even thinking. The percentage win rate is climbing quite high and the accounts are all growing nicely. Almost doesn’t seem fair to know who is controlling price, but sure is rewarding! TechniTrader TC2000 Balance of Power Indicator Study Course review - by Evan W. - "outstanding and has really helped me put it all together"
I just wanted to thank you all for the excellent education you provide. The course on (TechniTrader Elective Course TC2000 Balance of Power Indicator Study) BOP was outstanding and has really helped me put it all together. By knowing who was in control of price, I was able to trade the momentum out of a bottoming stock for a two day trade and a profit of over $10,000. That will put a smile on anyone's face. Thanks again for all that you do. TechniTrader Position Trading Course review - by Shabaz M. - "The Position Trading course is worth EVERY CENT"
One could debate how robust Martha’s courses are but she does bring you to stop searching for the holy grail and those “fantastic picks,” “secret set of indicators,” “doubling your money in no time,” “setting up a mechanical trading system,” etc. Once that stops one is perhaps ready to embark on the “Zen of Trading” journey AND there is no secret – just Martha’s knowledge and common sense, and one has to start using those forgotten grey cells of which we may still have a few left. Like many so called Gurus I have come across, Martha does not seem to have withheld the “secrets” of how to become a good trader and it is very clear, genius is one percent inspiration and 99% perspiration. The (TechniTrader Elective Course) "Position Trading" is worth EVERY CENT. I had to go over it 3 times to understand it. It opened my eyes. Just fantastic, let Martha know. Thanks Martha for helping me fight for my dream to become financially independent come true! I just want to thank you for the (TechniTrader Elective TC2000 Indicator Study "Time Segmented Volume") TSV Course that you put together. It definitely was challenging to learn, especially the (Rate of Change) ROC indicator. I'm thankful to Mele for answering many questions that I had about it. I am simulator trading picks right now, and I am using the things that I have learned to make sure I am understanding it all correctly. I cannot believe the difference in my knowledge and ability that I have gained in the last year. Also the (Daily Market Educator subscription publication) DME's and Morning (Market) Reports are just so valuable to me. I print them out often, and go through them repeatedly. I have an entire 3 ring binder of notes that I have typed out, from everything that I have studied over time. Your courses from the (TechniTrader Methodology Essentials Standard Course) ME10 and beyond are just perfectly made for beginners. You have a way to explain things so detailed that I was able to comprehend it eventually. I just know that trading is going to be a huge part of my financial future. TechniTrader "Position Trading" Course review - by Olivia M. - "Thanks so much for the training. The (DVDs) video's, booklets, worksheets and customer service is all set up for an excellent learning experience." Just a quick note to say hello and let you know I've completed the TechniTrader Methodology Study Course & the "Position Trading" course. My husband and I took the courses together. We have our own office space, computers, My Track account and all necessary online trading tools. We bounced information and questions off each other which really helped us clear up a lot of questions. Also my brother, who completed the course approximately 4 years ago, started trading, making money and decided to retire early convinced me that this was something I wanted to be a part of. As I continue to practice, I've decided that I am both a Position Trader studying fundamentals over the weekend and selecting stocks for my watch list by Sunday night, and Swing Trading through the week looking for buy signals for next day orders. It seems to be working. I currently have 4 practice Position Trades in the money for which I do weekly maintenance, and search for Swing Trades through the week. Thanks so much for the training. The (DVDs) video's, booklets, worksheets and customer service is all set up for an excellent learning experience. TechniTrader Annual Symposium for Technical Analysis Report review - by Michael D. - "It has dramatically increased my understanding of market structure and roles of the participants." Thanks so much for the (TechniTrader Report) on The Annual Symposium for Technical Analysis. It has dramatically increased my understanding of market structure and roles of the participants. And for years I have been taking the NYSE floor trader’s advice, found myself a great teacher and glued myself to your hip. 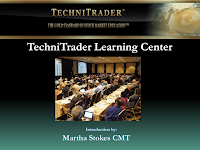 TechniTrader New Technology Stock Cycle Lab Class review - by Janice J. - "It was a very enlightening class. Well put together, I learned so much"
Just to let you know, you can pass this on if you need to. It is in reference to the (TechniTrader Elective Course) New Technology Stock Cycle Lab Class: It was a very enlightening class. Well put together, I learned so much. Will be re-reading it over and over. So much information packed into eight classes. I have found the best way to learn is to copy the lab lesson, and put them in separate binders so I can refer back to them. Please say thanks to Martha and all of you who helped put this class together. Very impressive. And thanks to you and your staff for putting up with all my questions. TechniTrader Swing Trading Course review - by Roger M. - "Thank you for changing my life, as I continue to learn more and more." Just wanted to touch base with you. I finished the advanced (TechniTrader Elective Course) Swing Trading last week. You know, you are so very detailed about your teaching, but it is all so vital for us to learn and know all of it. I have taken many courses over the last 2 years and in early September finally threw some good money for me anyway, into my trading account. I have really learned how to find the pros before the runs just by all the tips you have talked about, your wiki file information that I have printed out and studied, looking through tens of thousands of charts over the years, and studying all that I have over and over. My wife even as of mid summer was really unsure about whether this was going to go for me. Well, in July, I paper traded after Brexit and made 25% in 5 weeks. I thought that was really good, till now. I have gotten to the point that when I am looking for the pros, the charts and volume are telling me when the pros are getting ready to run stocks up. I had 2 big hitters in the last week and a half. I have gotten into a few others that haven't done as well, but I am never getting into anything that is losing me money. I have hit my last 14 trades, paper and real trading included, without any loses. I really am understanding that volume is such a key to everything. The market bias is important, but the participants are even more vital as long as the pros are in and I can find them. I have made 17.5% in the last 9 trading days of my total trading account. I can't imagine how long it takes to put these courses together, and I just want to tell you thank you for changing my life, as I continue to learn more and more. I have been looking for a way to not work so hard like I have for 30 years now, and I know this is the answer that I have been praying for. You will never know the impact you are having on the students that really get what you are teaching. This isn't easy to learn, but it's starting to become automatic now and is well worth the thousands of hours I have given to studying the last few years. I see light at the end of the tunnel. TechniTrader Swing Trading Course review - by Teresa L. - "I am learning so much!" I wanted to tell Martha just how much I am enjoying the (TechniTrader Course) "Swing Trading." I am learning so much! TechniTrader Cloud Course review - by Mallory S. - "is teaching me the value of one focus at a time and specialization"
I also want to share that I am FINALLY deeply involved in my study of the Security Sector of Cloud Computing. Your (TechniTrader Elective) Cloud Course is teaching me the value of one focus at a time and specialization. Without the structure your courses provide I would not be enjoying the personal satisfaction I am experiencing as I study, learn and invest.